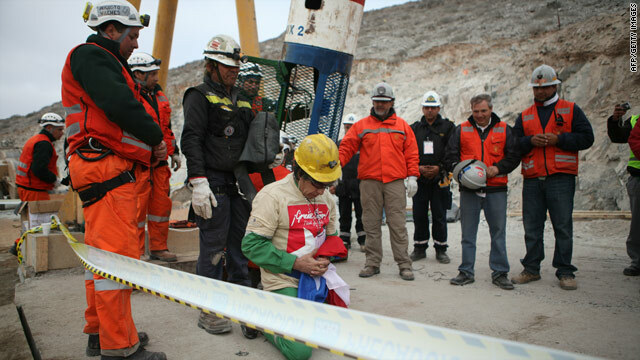 As miners were being pulled from Chile's San Jose mine Wednesday, most were wearing tan T-shirts over their coveralls. 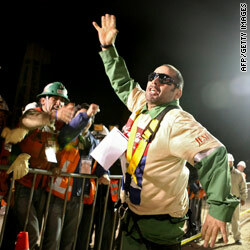 The Chilean government told reporters the green coveralls were designed to help absorb the sweat as they ascended to the top. But Wes Little, a CNN editor/producer in Atlanta, wondered why the miners were wearing the T-shirt over their coveralls. He noticed a logo on the T-shirt's left sleeve for the Jesus Film Project. The Jesus Film Project is a ministry of Campus Crusade for Christ International, the massive Orlando, Florida-based evangelical ministry. The Jesus Film Project tells us they have translated the film into 1,105 languages and that it has been seen in every country. You can watch or listen to over a 1,000 of the translations here. The main goal of TJFP's ministry is to create and distribute effective media in every language, says Berry Fiess, the group's director of field information services. Seventeen days into the mine accident, CCCI country director for Chile, Christian Maureira, started contacting public officials to see if they could send the miners a copy of the film. Fiess said Maureira was able to reach a daughter and a brother of miner Jose Henriquez. "The T-shirts were a gift from Campus Crusade for Christ Chile," Fiess said. "In the front you can read, 'Gracias Senor' - 'Thank you Lord.'" Extremely rated post. I be taught one thing tolatly new on tolatly different blogs everyday. Deciding on one . stimulating to read the paper content from different writers and be taught somewhat something from their website. I'd like to use sure of this content material on my weblog you're mind. Natually I'll give a link here we are at your internet-site. Appreciate your sharing. Bless the miners. Bless the people who worked so hard to get them out & those that cared for their souls. The comforts that were made physically, emotionaly & spiritually for them was the right things to do. Bless you all! Appeircation for this information is over 9000thank you!